Is Tahitian Noni® Juice safe for kids? ? Is Tahitian Noni® Juice safe for kids? Yes, Tahitian Noni® Juice is the juice from a natural food. Drinking it is no different than drinking apple or orange juice. When is the best time to drink Tahitian Noni® Juice? For best results drink it before meals, preferably on an empty stomach. Are there testimonials of benefits received from Tahitian Noni® Juice? Yes, in fact most of the testimonials regarding the benefits of Noni, were made by people drinking Tahitian Noni® Juice. What is the best way to drink Tahitian Noni® Juice? You can drink Tahitian Noni® Juice with or without mixing with water. Some people like to mix it with some other fruit juices. Try it Now! 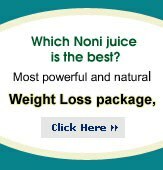 Why wasn't Noni juice marketed before? It had not been marketed in juice form before because of its foul taste and smell. Do you have some To-The-Point information about Tahitian Noni® Juice? 100% authentic Tahitian Noni® juice -- nothing added except a small amount of natural fruit juices for flavor. A pure natural fruit juice. A totally new exclusive product. Grown and harvested in the most pristine environment in the world. Absolutely pure and natural -- no chemical residues, no toxins, no pesticides, no heavy metals, no fertilizers. Processed with a proprietary method to maintain its bio-activity and keep active components intact. A concoction of several non-related ingredients. A concoction of different Morinda species (do you know that there are over 100 Morinda plant species? Many of them, including Morinda officianalis, are quite common and readily available on the open market but do not have the same benefits that are found in Morinda Citrifolia -- there is only one Morinda Citrifolia). Will Tahitian Noni International continue to develop other products? New products must originate from the Morinda Citrifolia. This is Tahitian Noni International (Morinda)'s Mission and Passion. We have nothing against other herbs or supplements. However, Tahitian Noni International came into existence for one reason: to bring the miracles of this amazing plant to the world. Tahitian Noni International accepts world leadership in this undertaking and have attracted scientists, governments, and talented individuals from a broad base of experiences as enthusiastic allies in our venture. New products must be absolutely true to the historical and scientific research that has been done on Morinda citrifolia. New products must be unique, effective, and stand alone. Tahitian Noni International will never introduce a "Me Too" product or one that cannibalizes any other Tahitian Noni International product. Why is Tahitian Noni® juice packaged in a glass container? Wouldn't it be less expensive to ship if it were in a plastic container?Glass packaging allows Tahitian Noni International to thermal treat the juice in the bottling process, thus avoiding the use of any preservative. Tahitian Noni International (Morinda)'s primary desire is to bring the juice of the Tahitian Noni® juice to market with the same purity as it is used in the islands. The thermal treating does not hurt the effectiveness of the product. Glass packaging prevents the gas-exchange problem experienced with a plastic container. The last drop of Tahitian Noni International (Morinda)'s Tahitian Noni® juice will be as fresh and pure as the first. Glass packaging insures maximum shelf life. Remember, Tahitian Noni Juice glass container is completely recyclable. How do I receive the best results? Will the juice interfere with my medication? We suggest you consult your doctor. Usually Tahitian Noni® Juice does not interfere with any medication. A person should keep taking the nutritional supplements along with the Noni juice. The Noni juice works as a catalyst to open up the receptor sites of our cells, that way our cells can have better absorption of nutrients. What amount should be used for pets and animals? Veterinarians are suggesting one ounce a day for small animals, two ounces a day for medium animals, and 3 ounces per day for large animals. This formula seems to be working. The Noni skin supplement seems work well on animal skin too. What does Tahitian Noni® juice cost and how can I order it? There are two ways to purchase Tahitian Noni® juice. The first is at Retail and the second is at Wholesale. The highest price you can pay for one bottle is $42 and $188 per case. If you join as a wholesale buyer, you can save between $10.00 to $12.00 per bottle and $40 to $48 per case. Please call Toll-Free LIVE OPERATOR ORDER LINE at 1-888-568-6029 to know how to buy products at wholesale prices or OR Fill up the form to provide us your name and contact information. We will contact you immediately. I am basically healthy - Will I benefit from the juice? Drinking Tahitian Noni® juice supports and benefits many systems of the body and works at the cellular level. Immune system. It supports the immune system, which strengthens the body's natural ability to fight disease and infection. Circulatory system, tissues and cells. It is a superior anti-oxidant that helps the body rid itself of harmful free radicals and may increase the energy level. Digestive system. It supports proper digestion, which means you absorb more nutrients at the cellular level. Other benefits. These may include increased mental clarity, increased attention span and greater physical performance levels. Try Now for Optimal Health. All orders come with 30 day Money Back Guarantee! What does Tahitian Noni® juice taste like? Tahitian Noni® juice has a pleasant grape/blueberry taste. While most users prefer the taste of the refrigerated juice, others like the taste better at room temperature. Very rarely, we find someone who prefers to mix it with some other fruit juice such as orange. What if I get a reaction of some kind? What if I stop drinking Tahitian Noni® juice it, do all your previous aches and pains return? If the affects last, how long?We have different experiences with our customers. It is very subjective to each individual. Some people may experience no return of their previous aches and pains, some people may. Tahiti and Her Islands comprise an area officially known as French Polynesia. The islands are scattered over four million square kilometers of ocean in the eastern South Pacific and consists of five archipelagoes: the Society Islands, Austral Islands, Marquesas Islands, Tuamotu atolls and the Mangareva Islands. Tahiti is the largest island in French Polynesia. The island of Tahiti is a range of lushly forested peaks plunging deep into the sea. The Tahitians are a handsome people noted for their hospitality, friendliness and easygoing approach to life. Cooled by the gentle breezes of the Pacific, the climate in French Polynesia is sunny and pleasant. French Polynesia is 10 hours behind Greenwich Mean Time and 2 hours behind US Pacific Standard Time. The currency in Tahiti is the French Pacific Franc (CFP), though credit cards and US dollars are common. A 1996 census counted 219,521 people living in French Polynesia. I just got Tahitian Noni® juice but it appears that it is already expired? Your Tahitian Noni® juice is FRESH. The international date format on Tahitian Noni® juice bottle causes some confusion among customers in various countries. The date on the bottle is in following format: Year/month/date. If you see a stamp of 04/02/01, it means Tahitian Noni® juice will expire in 1st of Feb, 2004. Tahitian Noni International (Morinda) chose this international date format because Tahitian Noni® juice get shipped all around the world.